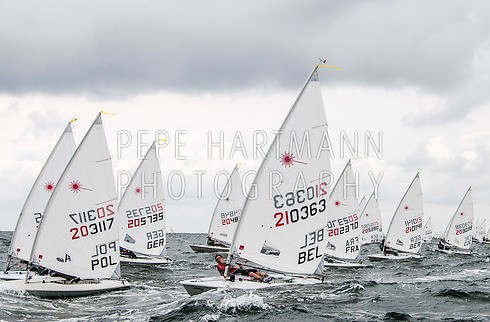 Two races for each of the three Laser fleets were held yesterday at the Warnemünde Europacup. In the Lasers Standards, Theodor Bauer GER defended his lead ahead of Sergey Komissarov RUS. Maxime Mazard FRA and Eliot Merceron FRA follow on the ranks 3 and 4. Anne-Marie Rindom DEN finished for the first time ‘only’ on rank 2 in the Radials women, but with 5 bullets in 6 races, she remains the clear leader. Hannah Anderssohn GER and Pia Kuhlmann GER keep the ranks 2 and 3. In the Radials men, Federico Tocchi ITA was again the day’s best with the ranks 1 and 2 and has a 3 points’ overall lead on the 2nd-rank Daniil Krutskikh RUS. New on the 3rd place is Nathan Le Pen FRA. In the Lasers 4.7, Joshua Richner SUI lost his first place after an abandoned race. Christian Spodsberg DEN has taken the lead ahead of the Swiss down on rank 2 who keeps the lead in the U16 rankings.